This article is about a recent bug that occurred in Facebook and affected most of the websites in the world wide web. Many websites, including the major and hugely popular ones like MSNBC.com, CNN, Pinterest, ESPN, TED, HBO, WordPress, Yahoo, and The Washington Post, were brought down by an error in a Facebook script on February 7, 2013. 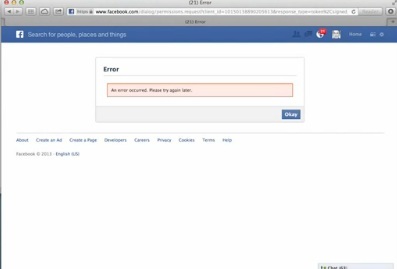 Upon visiting the websites, users were redirected to an error page inside of the Facebook website. Most sites use this small Facebook script to allow visitors to “like” and “share” their products and news on Facebook. So, although Facebook quickly fixed the issue, millions of users were affected by it. Now, imagine a malevolent hacker somehow finding a way to inject their code into legitimate websites in this manner, and having his/her script executed in millions of machines almost instantaneously. Sends shivers down the spine just to think how vulnerable our internet really is. And check this out.. it’s as creepy as it gets..